Ebury is a global provider of white label solutions to Money Services Businesses, Corporate Service Providers, Banks and other financial institutions. We provide bespoke solutions enabling you to grow your revenue by leveraging our capabilities as well as increase your client retention by offering services outside your remit. Our platform gives you access to deliverable foreign currency exchange solutions, enhancing the services provided to existing customers, with no additional operational and compliance risk, all within an FCA regulated environment. As a non-regulated entity, you can offer your clients FX and international payment services. As a regulated entity, you can offer your clients FX and international payment white-label services from Ebury’s platform, while still dealing as principal with your clients. 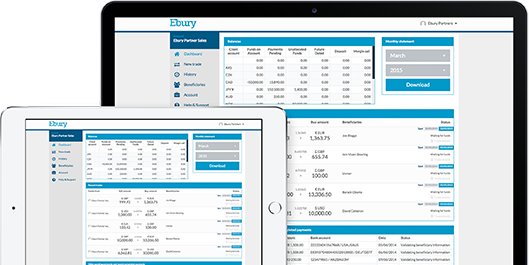 As turbulence hit the sector and banks started cutting lines, I was amazed how easy the transition was to work with Ebury. They tailored their whole service to my business needs and created a white-labelled product, suddenly I had Ebury’s strengths as my own. I can now offer products and efficiency I wasn’t able to deliver before. I run a small brokerage, but being able to introduce the capabilities of an established company, meant I was able to target a much broader market. Using Ebury’s technology and liquidity services meant that my business was now able to compete. Having an online trading platform with functionalities such as multi-payment upload and 4-eyes sign off, now means that any sized business could be our customer.